In a medium bowl, soak the bulgur in the boiling water for 15 minutes or until all the liquid is absorbed. Meanwhile, bring a stockpot of water to a boil. Place the whole head of cabbage in the boiling water for about 2 minutes. Remove the cabbage and cut off 4 leaves at the core. Repeat twice more, removing 12 leaves altogether. Return the leaves to the boiling water and cook for 4 minutes or until tender-crisp. Drain, rinse under cold water to stop cooking , and pat dry. Heat the oil in a skillet over medium. Add the onion, rep pepper, and the mushrooms and sauté for 5 minutes. Stir in the zucchini, basil, salt, thyme, mint, and black pepper. Partially cover and cook, stirring occasionally, for 10 minutes or until the vegetables are tender and the liquid is evaporated. Stir in the bulgur. In a small bowl, beat the egg white and lemon juice and add to the bulgur-vegetable mixture. Stir in 1 cup of the cheese. Preheat the oven to 400 F. Lightly grease a 13″x9″x2″ baking dish. Spoon 1/4 cup of the bulgur mixture into the center of a cabbage leaf. 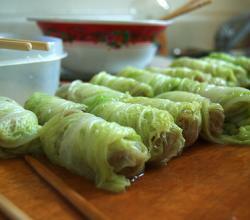 Fold the sides of the leaf toward the center, then roll up the leaf and place, seam side down, in the prepared dish. Repeat. Stir the red pepper sauce into the tomato sauce and spoon the sauce over the cabbage rolls. Sprinkle the remaining cheese on top. Cover and bake for 25 minutes. Uncover and bake 10 minutes more or until the cheese is golden. Accompany with rye bread.